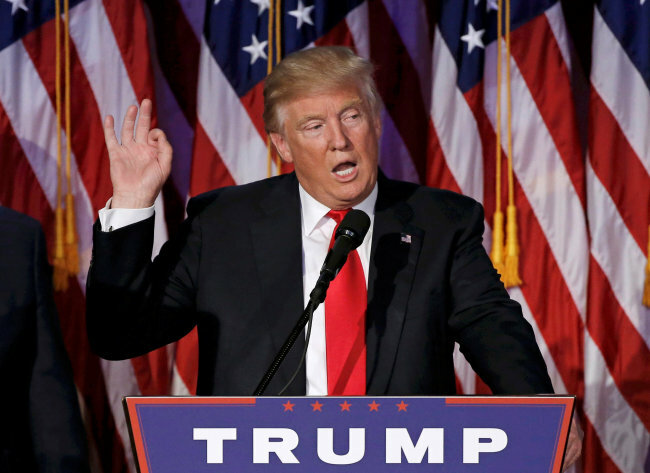 US President-elect Donald Trump said Sunday he has never suggested more countries should acquire nuclear weapons, disavowing what has been one of the main sources of criticism of his foreign policy views. Trump surprised experts and officials in March when he broached the idea of allowing South Korea and Japan to develop their own nuclear weapons for self-defense in an interview with The New York Times, saying it would help lessen US security burdens. A few days later, Trump reiterated he's open to allowing more countries to go nuclear. "At some point we have to say, you know what, we're better off if Japan protects itself against this maniac in North Korea. We're better off, frankly, if South Korea is going to start to protect itself," Trump said at the time, referring to North Korean leader Kim Jong-un. But on Sunday, Trump denied he ever made such a suggestion. "The @nytimes states today that DJT believes 'more countries should acquire nuclear weapons.' How dishonest are they. I never said this!" Trump said in a Twitter message, rejecting The New York Times' criticism of his foreign policy. Trump's nuclear armament suggestion sparked a firestorm of criticism from administration officials and security experts, and has been a main source of criticism of his foreign policy views. Secretary of State John Kerry slammed the suggestion, saying nothing can be "more volatile" or "more contrary" to peace and stability.